Last week I did my first workshop at Radar and I am very happy with the results! We posted it at their Facebook and around 9 people came, which was perfect, because we used almost all the space and tables we had. In Holland I have had this workshop one time myself in a art class, so I tried to give it here. It was a little bit scary because I wasn’t sure if it would all be understandable or if it all would work out, but it did! And most people were surprised by their result, so that was good. The start was a bit chaotic, but I think it’s quite normal that in this kind of social places the timeschedules are not so strict as in a office. I tried to realize I am not in Holland and be a bit more patient J. The workshop was translated by a collegue and actually the language barriere was nota a problem at all. So that’s perfect, by creating together you communicate in another way. Because my Hungarian is still very bad, I only learned a lot of grammar rules at the laguage school, which don’t help me to speak until now. 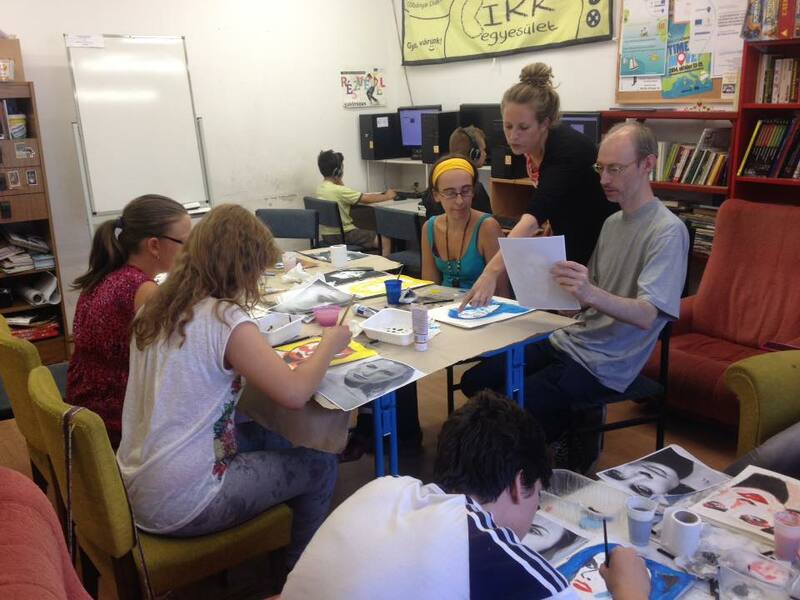 During the workshop it was most fun for me to see the different characters of the people by doing their painting. One child, the youngest one, didn’t think so much and was just busy with the colors from the beginning, no doubts, just go with the flow. He finished as first, ran back to the computer and left a beautiful painting. I was impressed. The children who were a bit older were more consious about their work and were more afraid to make mistakes as well, so they took it more serious and tried everything a bit more slowly and very precize. And then the adults between them had already some pictures in their mind, so it only could turn out as a bit a disappointment for them, because the picture didn’t look like their ideas. I think the next day when they look at it they will be happy with it as well. So for me it was quite interesting to see this difference among the people and ages and next time I will try again to mix all ages. Why not, we can learn from eachother! I actually learned from the child who just started without thinking to much and found out what he wanted to create during the process. And everyone can have it’s own personal goals. Now I am thinking about a small project to decorate the walls of Radar in a nice way, I will tell you next time what I did. It’s so nice that I can experiment in this non formal atmossphere!